Somalia's virtually powerless government was unraveling as a fifth of its Cabinet resigned in disgust and the administration's Islamic rivals took over the presidential palace in the capital of Mogadishu. Eighteen key ministers in the 102-member Cabinet said Thursday that their government has failed to bring peace to this chaotic African nation as it emerges from 15 years of anarchy. The leadership has no power outside its base in Baidoa, 155 miles from the capital. "We have seen that the government cannot carry out national reconciliation and development," according to a letter of resignation issued by the lawmakers, who include the ministers for domestic cooperation and for planning and international relations. A motion of no-confidence in Prime Minister Mohammed Ali Gedi had already been issued and will be debated in Parliament on Saturday, the lawmakers said. Government spokesman Abdirahman Mohamed Dinari said Gedi has not decided whether to accept the resignations. The lawmakers also said they were opposed to troops from neighboring Ethiopia who were sent here to protect the government from the Supreme Islamic Courts Council's militia, which has seized control of the capital and much of southern Somalia. The Islamic militants' increasing power has prompted grave concerns in the United States, which accuses the group of harboring al Qaeda leaders responsible for deadly 1998 bombings at the U.S. embassies in Kenya and Tanzania. The Islamic group's imposition of strict religious courts also has raised fears of an emerging Taliban-style regime. On Thursday, the militia said it was setting up a religious court inside the vast complex in Mogadishu that once served as the country's presidential palace — a highly symbolic move that further marginalized the official administration. "This is the place where Somalia will be ruled from and we appreciate your cooperation with the courts," said Abdirahman Janaqaw, a senior member of the Supreme Islamic Courts Council. The complex, known as Villa Somalia, sits on high ground with access to the harbor and the airport. The last Somali leader to live there was dictator Mohamed Siad Barre, who was ousted in 1991. The country soon descended into armed camps ruled by violence and clan law, and members of a Mogadishu clan loyal to the Aidid family controlled the compound for the past 15 years. Somalia has been without an effective central government since warlords toppled Barre, after which they turned on each other, carving much of the country into armed camps ruled by violence and clan law. The government was established nearly two years ago with the support of the United Nations, but it has been wracked by infighting. The leadership also includes some of the widely despised warlords linked to the violence of the past. Thursday's resignations were "a very serious blow to the government led by the prime minister," said Omar Jamal, executive director of the Somalia Justice Advocacy Center in St. Paul, Minnesota, a hub for U.S.-based Somalis. The relationship between the Islamic militia and the official government has been deteriorating steadily in recent weeks, despite plans for peace talks. 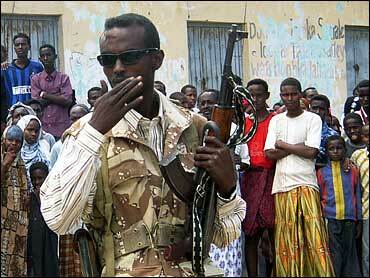 Last week, the militia got within striking distance of Baidoa, the only town controlled by the government. Witnesses reported seeing troops from Ethiopia cross the border to protect the fragile administration. On Wednesday, a cargo plane the government alleged was loaded with weapons sent by Eritrea landed in the capital and was swiftly unloaded by Islamic militiamen. Ethiopia and Eritrea fought a bloody border war from 1998-2000, and have since backed rebel groups to destabilize each other. Somalia could become a new front in their conflict. In a statement issued by Eritrea's minister of information, the government called on Ethiopia to withdraw all of its troops from Somalia. "It further calls to let the brotherly people of Somalia be masters of their own destiny, by providing them a chance to build a harmonious and stable nation," Eritrea said. Ethiopia also lashed out at its rival, with the country's foreign ministry spokesman saying Eritrea was arming the militants while "disseminating anti-Ethiopian sentiments."